Martha J. Fender, daughter of Allen FENDER & Nancy EDWARDS, was born Feb. 17, 1838, in Ashe Co., NC, and died Feb. 28, 1920, in Alleghany Co., NC. She married (1) William Reynolds. He was born abt. 1832 and died July 1, 1862, in Richmond, VA, during the Civil War. She married (2) Francis Bryan Cheek, son of Henderson CHEEK & Lucy BRYAN, Sept. 26, 1868, in Alleghany Co., NC. He was born Apr. 20, 1841, in Ashe Co., NC, and died Feb. 27, 1934, in Alleghany Co., NC. Martha Fender Cheek is buried at the Hiram Edwards Cemetery on Road 1162, Bledsoe Creek, Alleghany Co., NC. Her husband F.B. Cheek is buried at the Liberty Baptist Church in Whitehead, Alleghany Co., NC. Isom C. Reynolds, b. Sept. 7, 1853; d. Mar. 9, 1936, Alleghany Co., NC; m. Susan A. COX, daughter of Joshua COX & Mary Jane HIGGINS, abt. 1872 (b. May 29, 1853; d. Jan. 18, 1918); bur. Antioch Primitive Baptist Church, Alleghany Co., NC. Children: Martha J. Reynolds (1873), Nancy Emmeline "Emma" Reynolds (c.1874), Ennice Reynolds (c.1876), Cornelia Reynolds (1877) m. Starling Columbus RICHARDSON; Charlie M. Reynolds (1879) m. Della RICHARDSON; Florence Reynolds (1882), Margie Annice Reynolds (1885), Mary A. Reynolds (1887), Pearlie Reynolds (1890), Walter S. Reynolds (1896). Nancy C. Reynolds, b. abt. 1857, m. John Wesley CROUSE, son of Henderson CROUSE & Mary A. HOWELL, June 3, 1878, Alleghany Co., NC. Children: Elbert Crouse (c.1878), Melvin Crouse (1880), Delia Crouse (1882), Ethel Crouse (c.1885), Helen Crouse (c.1887), Ida Crouse (c.1889), Eva Crouse (c.1891), Leonard Crouse (c.1894), Norman Crouse (c.1895), Rudolph Crouse (c.1898), Garrett Crouse (c.1902). Allen Reynolds, b. June 16, 1861, d. Feb. 13, 1938, Wilkes Co., NC; m. Mary Ellen EDWARDS, daughter of John E. EDWARDS & Delilah Jane HIGGINS, Nov. 27, 1881 (b. Mar. 26, 1864; d. Sept. 3, 1932). Children: John M. Reynolds m. Sarah H. RICHARDSON. Joseph Franklin Cheek, b. Feb. 15, 1869, Alleghany Co., NC; d. Oct. 28, 1963, Buncombe Co., NC; m. Sue Estus BRADLEY, daughter of William Turner BRADLEY & Mary Louise HOLCOMBE, abt. 1897 (b. Feb. 2, 1876; d. July 21, 1962); bur. Morgan Hill Cemetery, Buncombe Co., NC. Children: William Francis Cheek (1897), George Hazlet Cheek (c.1902), Mary Mildred Cheek (1905), Margaret Cheek (c.1911), Gladys Cheek (c.1913), John Cheek (c.1916). Solomon Maurice Cheek, b. Sept. 9, 1870, Alleghany Co., NC; d. Feb. 22, 1954, Tulare Co., CA; m. Annie Bernice BRANSFORD, June 24, 1902 (b. abt. 1880 in TN; d. aft. 1930.) Children: Maurice Bransford Cheek (1904), John Lambuth Cheek (1907). George Washington Cheek, b. Aug. 11, 1872, Alleghany Co, NC; d. Feb. 3, 1964, Boulder Co., CO; m. Mervyn Florence JONES, daughter of Hilary JONES & Nancy Jane HAMPTON, abt. 1903 (b. Mar. 17, 1881; d. June 27, 1957). Children: Nancy Ewing Cheek (1904), Margaret Jane Cheek (1919). Rebecca Caroline "Bessie" Cheek, b. Mar. 17, 1877, Alleghany Co., NC; d. Jan. 6, 1964; m. Wilborn Berry ESTEP, son of Hiram John ESTEP & Mary Ellen ESTEP, Nov. 28, 1900, Alleghany Co., NC (b. Sept. 22, 1874; d. Mar. 8, 1941); bur. Liberty Baptist Church Cemetery, Alleghany Co., NC. Children: Kemp Maurice Estep (1901), Mabel Estep (1904), Dr. John Herbert Estep, M.D. (1909). artha J. Fender was the oldest child of Allen FENDER and Nancy EDWARDS. 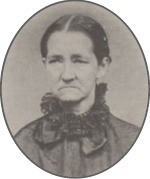 Her first husband was William REYNOLDS, who died in the Civil War. The death certificate of Martha's son Allen REYNOLDS identifies his parents as William REYNOLDS and Martha FENDER. Martha and William were probably married around 1852, although for some reason they are not listed in the 1860 census of Alleghany County. However, William REYNOLDS was a resident of Alleghany County when he enlisted in the Confederate army on May 27, 1861. He died of gastritis on July 14, 1862, at the hospital in Richmond, VA. (Source: "American Civil War Soldiers," Ancestry.com, and "Ashe and Alleghany County in the Civil War" by Jeff Weaver.) Martha married Francis Bryan CHEEK on Sept. 26, 1868, three years after the end of the war. Francis B. CHEEK served with William REYNOLDS in Co. F, 22nd NC Infantry Regiment. Martha appears in the 1870 census with her new husband Francis B. Cheek and her daughter Nancy REYNOLDS (age 15). However, Martha's sons Isom (age 16) and Allen (age 10) were living with their grandparents, Allen & Nancy FENDER, in 1870. Martha died Feb. 28, 1920, at the age of 82. She is buried at the Hiram Edwards Cemetery in Bledsoe Creek, where her parents are buried, not the Liberty Baptist Church in Whitehead where most of the Cheek family were laid to rest. For additional information, see notes under Francis Bryan Cheek.